Stefan Poag can be contacted at sbpoag(at)gmail(dot)com. He lives and works in Michigan with his significant other (Annie) and two dogs. During the week, he works a deskjob at a Detroit automotive manufacturing company. He also draws, paints and sometimes makes mosaics, usually just for his own pleasure but also sometimes for hire. His illustration work has appeared in publications from Goodman Games, Kenzer & Company, Game Developer and others. He is available for commission work. He is currently working on a book about monsters to be published by LotFP in 2012 2013 2014 2015 who knows. He has written a 40 page comic book about Richard Shaver and the Dero Conspiracy which is currently looking for a publisher and has also converted an HP Lovecraft short story to a comic book, so, if you are in publishing, well, let’s talk. Hey! Thanks for stopping by! You from Michigan? I’m a transplant from parts further south, but I love it just north of the big D. If we cross paths in real life I’m gonna ask for your autograph on my copy of ‘Unknown Gods’! Thanks for all the great art and inspiration. I like your blog , I gave you a follow can’t wait to see more. Heya! I’m digging your blog and reading it at Ann Arbor. I came to your work through DCC. I’m inspired by your drive and commitment. My sketchbook has more drawings recently, and you are partially responsible for my inspiration! Wow – thank you. Do you live in Ann Arbor? I will try to make it to U-Con in Ypsilanti next year (I think it’s in Nov?). I came across your name during my search into my distant past.Recently after over a 30 year intermission in my world of role playing,I awoke one morning after an usually vivid dream about a bullywug and a terrible demon(actually I had that dream after watching the first episode of STRANGER THINGS on Netflix,Good god that took me back! )and decided to enter the fray of RPG’s once again. I sat down to play with these much younger folks and was appalled by how the game proceeded.First I asked myself several questions.Was this how we played in 79-80′ but I’ve changed so much my perception of the game was different and I just had some romanticly childish notion about fond memories of younger days? As I sat at this table surrounded by living people,all of whom were deeply involved in looking up some rule or stat the entire session,I had to consciously restrain myself from saying what I thought were obvious things. I left that night disappointed.What had I hoped to experience that night?feeling 14 again?I wasn’t sure but If That felt like a statistical nightmare to me then there must be others,right?I dreaded the thought maybe I had died in my dream and this was my hell.D&D now used by illuminati powers to inprison young minds into doing pseudo math.Jesus,I shuddered and continued on in my search. 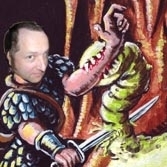 After a few days of net-hounding I started to find terms like retroclone and OSR and such,was I on the right path?I seemed like most of these blogs were from 2010-11 or so.Was this a passing thing this old school revival?To be sure,I dunno but I found Labyrinth Lord and Swords&Wizardry.Thus found an anchor the strange unfamiliar seas of current role playing. The name of your adventure keeps popping up during my searches.This “mines of Khunmar” that you have created sounds like would be right up my alley.Does it still exist?Is there copyright control issues and you cannot release?Ive run into a similar wall with Brave Halfling made adventures(another name I keep coming across),as they seem to have vansished. I’ve gathered a group of open minds and plan on DMing a game,I would love for yours to be my first in three and a half decades.Let me know,if not,no worries and all the best! you can write to me at sbpoag(at)gmail(dot)com and I will attempt to reveal my secrets.